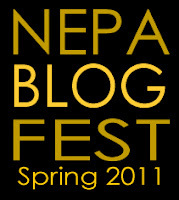 NEPA Blog Fest (Spring 2011 Edition) has come and gone. For various reasons, I didn't get out of the house until after the event starting time of 6:00, by which time Michelle (who got there ahead of time) had texted me to be sure I was coming. I picked my way along River Road / Main Street / Plank Road / South Main Street (the same street wears all these names between Plains and Pittston), noting the places where the Susquehanna River was lapping right up against the road, making a mental note to take another way back and hoping and praying that the river wouldn't experience a surge while we were all a stone's throw away at Rooney's. I parked my car in front of the now boarded-up Valley Cat Rescue and walked a hundred feet or so down the street to Rooney's. When I entered at 6:40 I was surprised to find the place half-empty - previous events had been jammed from start to finish. I wondered if maybe the word hadn't gotten out. I myself had missed the initial announcement, as it was cleverly hidden away in a blog post on Dave Yonki's site entitled The LuLac Edition #1515, March 21st, 2011 - not exactly a title that screams "Blog Fest is coming!" This post referenced a post on Joe Valenti's Pittston Politics - which, due to an unfortunate problem with blog architecture, does not have an RSS or Atom feed, and so his posts never appear among the list of most recently updated blogs. (The bottom line is, if you're not making a point to read every word of every entry on these blogs, you might miss something and never be aware that it had been posted.) Even I had only mentioned this event in passing on a Facebook update when I found out about it a week or two after the announcement. So I was puzzled by the absence of people at the event. I saw Dave Yonki and Joe Valenti, who had organized the event and publicized it with their political contacts, sitting at a table chatting with a few people I didn't recognize. I spotted a friend of Gort's and asked him if Gort - the founder of these events and the third co-blogger on NEPA Blogs, who is currently on hiatus from blogging - might be coming, but he wasn't sure. Then I spotted Michelle on the other end of the bar and went to speak with her. She told me that the place actually had been crowded from about 6:00 to 6:30, filled with candidates who had then headed out to a 3rd District event in Dupont. Suddenly she spotted a familiar face where I had just been standing - Gort had arrived! Now it was a party! Michelle and I stepped down to talk with Gort, and I was called aside by Dave Yonki. Before I could get to Gort I was chatted up by several of the candidates who had trickled in and were working the crowd. (For a possibly complete list see Dave Yonki's after-Fest post.) I passed out Blog Cards and collected campaign cards and literature, and chatted with the charming, dedicated, and driven daughter of one of out local bloggers concerning her human rights legal efforts. WBRE showed up with a camera crew, acting on Michelle's tip, and conducted some interviews that appeared on the 11:00 news - but have not, as far as I can tell, been posted to their website, pahomepage.com. Unfortunately, while more and more politicians appeared as the night wore on, no additional non-political bloggers showed up, making the night one of mostly cocktail-party chatter between political bloggers and the politicians who are running for office. Even more unfortunately, Rooney's kitchen and waitstaff were apparently overwhelmed by the sheer number of people who had showed up and decided that they would like something to eat. Political chit-chat can work up an appetite, something I hope they keep in mind the next time there's an event held there. From a political blogging point of view I suppose this was a relatively successful event, despite the unfortunate conflict with the event in Dupont. 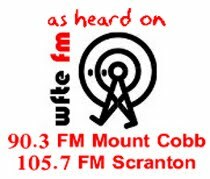 (This was not the only conflict of the night, however, as the Luzerne County Historical Society dinner and the annual Muscular Dystrophy Association benefit Black and Blue Ball were being held last night as well.) I would like very much to see future blogger gatherings where the focus is not on politics, but on the bloggers and their blogs. Too often some people think of political blogs as the only sorts of blogs out there. 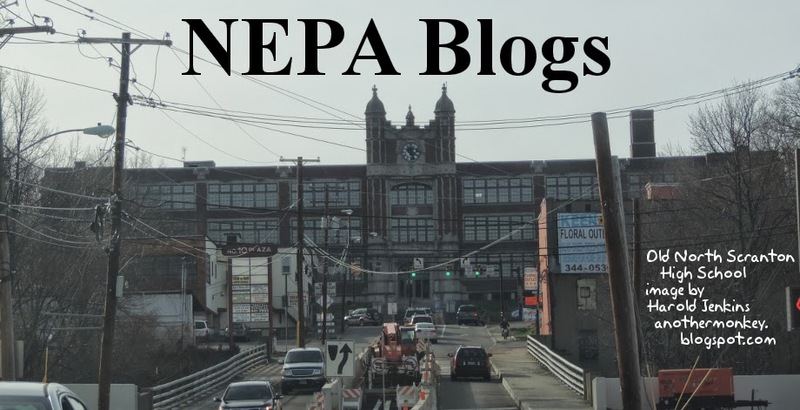 A look at the roster of blogs that have been added to NEPA Blogs over the years will show that there are many interests in the local blogging community beyond politics. There are blogs about religion, photography, shopping, employment, beer, sports, cars, art, history, television - the whole scope of human experience, including and in addition to politics. I hope to see some of these bloggers at future get-togethers! *Michelle is also responsible for bringing NEPA Blogs out of an extended funk, resulting in more posts and more sites added in April 2011 than in the previous twelve months combined. One of the original ideas behind NEPA Blogs was that it might be a nifty way to increase traffic to my personal blog. Yes: pure, unenlightened self-interest. Create a central site that had a one-to-many relationship, with links pointing out to dozens, maybe hundreds of other sites, and then have all those other sites link back to the central site. This would mean that every one of those sites would be just two clicks away from every other one of those sites. Everybody would benefit! I would start off by linking to all these blogs, and then ask everybody to link back to the central site so that every blog would now have increased linkiness by virtue of being linked by a highly-linked site. Yeah. I kinda forgot about that whole plan beyond the "linking to all these blogs" part. BUT BUT BUT!!! It's not too late! All I have to do is contact the 150 or so blogs where I'm pretty sure the blogger has no idea they've been linked by NEPA Blogs, and ask if they would consider a link back to the site. I'll get started on that...eventually. But I'm sure there's someone out there who can do better! Heck, I'm sure there are LOTS of someones out there who can do better, especially considering that I have no idea what the optimal design of one of these buttons is. So, if you feel creative, why not take a crack at designing a button? Send your submission to nepablogs (at) gmail.com. We'll list them all on the sidebar so people will have a variety to choose from! A blog by Michelle Herrigel, Psy.D., Clinical Director at The Devereux Foundation and a licensed psychologist in Pennsylvania, providing public education and information regarding common mental health concerns. LET'S DO THIS! Blog is the official WBS Penguins 2011 Playoff Blog. According to the first blog post, we are to consider this blog "the vault" for all things related to the Penguins playoff run. They are adding new content daily, and invite us to check back often. I will add this to the side Blogroll under the Sports Blogs section. Be sure to cheer on our boys tonight (4/30) at 7:05pm when they take on the Charlotte Checkers in Game Two of the East Division Finals. They will be playing at home from the Mohegan Sun Arena at Casey Plaza. You can listen/watch live from the WBS Penguins official website here. Reminder: Blog Fest is Friday, April 29! If you're not all tuckered out from waking up bright and early to watch some royal wedding, you should definitely consider attending the NEPA Blog Fest (Spring 2011 edition) on Friday, April 29 at Rooney's Irish Pub in Scranton starting at 6:00 PM. Area bloggers will be holding another blog fest Friday, April 29, 2010. This will be your chance to meet the face behind the keyboard. It will held again be at Rooney’s Irish Pub on Main Street in Pittston starting at 6:00PM. Stay as long as you’d like. Last time around Gort helped organize the shindig. Gort, however, has experienced a long case of writer’s block and hung up his keyboard. Dave Yonki, of the LuLac Political Newsletter has offered to step up to the plate and lend a helping hand. Our past two events were well attended. Last spring we had probably over 150 come through the door and that was an off year election. This year we expect an even larger turnout considering the excitement with this year’s primary. Admission is free, no speeches, you must buy your own drinks and you must wear clothes. My dear friend and mentor (Frank) Mike Burnside, sent me a request through Facebook to add his newest blog to the site. You may remember him from the Late Night Meanderings blog or his alter-ego "Bonanza Bob" from the great annual WVIA TV Auction. His new blog "Burnside Photographic" is specifically dedicated to his photography of all things local, which I must say is quite amazing. If you care to find out more about the man behind the camera, click here. His pictures tell a story that words cannot define. We received an email message from Jim Rising who was formerly the Program Director of 102.3 The Mountain and is an active columnist in the Weekender. Jim wants to make us aware of a new blog that he is starting located at: http://www.jamesrising.com/ It appears that the domain name is not working yet, but I'm sure it will be active soon. You can check out his old blog material at http://risingsrant.blogspot.com/ in the interim. "A random look at the life and times of Jim Rising recovering radio addict and newspaper columnist." In the words of Manny Gordon... "ENJOY ENJOY!" The Growing Up Geek podcast is (as you may guess) about all things considered "geek". The topics of discussion can run the gamut from comic books, to video games, to technology. I know at least one of the podcasters - NEPA's own Jason Percival - who is one of the master minds behind the microphone. I am not familiar with the other two gents, but I can assure you that if they hang out with Jason, they know their stuff. The podcasts, which are recorded weekly, are available for download free from the website or via iTunes. From the About Us section on the webpage: We may get older, but we will never grow up. We still buy action figures, play video games, and lust after the newest, shiny gadget. At times we are fanboys, and other times we are harsh critics. We tell it like it is. David DeCosmo, formerly of WYOU-TV 22 has started a blog "No news is..." (Good News) at Blogspot which I found about through visiting The Lu Lac Political Letter and reading the most recent blog post. We are happy to have him on board at NEPA Blogs and wish him many successful years of blogging! My friend from High School, Rachel, started a blog in March that I find very fascinating. The name of the blog is "Rachel of All Trades" - Jack of all trades, master of none, though oftentimes better than master of one. I think we can all identify with the above quote as bloggers. And with that, I will add Rachel to the sidebar so that you can check out her work! Conflicts are inevitable in life, and NEPA Blogs has become embroiled in one. The glory that is Blog Fest (spring 2011 edition) is scheduled to take place on April 29, which is coincidentally the date of the Luzerne County Historical Society annual dinner. Several individuals, it turns out, are involved in both the world of blogging and the LCHS, and having not yet learned the ancient discipline of bilocation cannot be in both places at once. Ideally, such a conflict would be resolved by violence and choreographed musical dance numbers. But this is not an ideal world, so several individuals will be at one event but not the other. This is Tuned, a blog all about cars. Old cars, new cars, fast cars, and yes even some slow cars. But mostly about custom cars. We'll test'em, review'em, show you where they're built, and interview their owners. Well also head down the track for some racing action and we'll even participate a bit as well. Check out Tuned at http://tunedtv.blogspot.com/ . I seem to be having either a case of deja vu or a case of blogging related Alzheimer's disease, because I could have SWORN this blog was already listed with us. Anyway . . .
A Girl's Gotta Spa :: A beauty blog... because we all deserve a little pampering. NEPA's own Shannon Nelson has been running this successful blog since 2005. To which she has extensive industry "Street Cred" detailed here. More from the About Page: A Girl’s Gotta Spa! (sm), as a way to bring relevant and easy to understand product reviews with a dose of honesty, integrity and humor to women across the globe. As one of a handful of beauty bloggers at the time, it resonated with women looking for product opinion before they made a purchase. As a woman, I do value Shannon's opinions before purchasing any cosmetics, hair accessories or styling products. Trust me ladies, she knows her stuff! She even recommended a new hairdryer for me when I was away in Green Bay on a work business trip after mine died. In addition to being a beauty blogger, she is also a LIFESAVER! I highly recommend this blog! A blog covering the activities and upcoming events of the Wyoming Valley Children's Association, including their upcoming 5k Run on Wednesday, April 27 and their 19th annual walk-a-thon on Saturday, April 30. WVCA was established in 1924 as Wyoming Valley Crippled Children’s Association. In 1985, the name was changed to Wyoming Valley Children’s Association. Two birding blogs by Kevin Ripka about birds found in Northeastern PA.
A local small business blog from photographer Brent Pennington. I thought we had a link to these guys, but I can't find it. Here it is now! Thoughts and opinions of Alissa Binker. "I'm a writer, and I occasionally dabble in painting and art. I follow politics. I'm an avid environmentalist." Abandoned places in and around NEPA. "Tips for building the Personal Brand you want by becoming the CEO of YOU." Nothing lasts forever, and sadly this is true even in the blogosphere. Sometimes people choose to end their blogs, putting a period at the end of a long string of posts. (And sometimes, they come back again.) Sometimes people just drift away from their blogs, setting them aside for months or years at a time but leaving them idling just in case they decide to put on their blogging hats again. Sometimes people stop blogging because they have died, ending their ability to post, or do pretty much anything else. Sometimes they simply shut down their blogs, deleting them and removing all of the content and all of the links they had assembled over the years. And sometimes other people squat these site names, taking over an established site for their own purposes. Michelle has been hard at work finding new blogs to add to NEPA Blogs, so I figured I may as well do some work and check every current blog link for functionality. I found a lot of blogs that haven't been updated in more than a year, but I'm holding out hope that some of these may be revived. I found some blogs that no longer exist, even blogs that were updated within the last few months. I found a handful of blogs that have been changed to be read by invited readers only. And I found several blogs that have been officially brought to an end, even though their content is still accessible. Beale's Bites has actually not been updated for several years. In its day it was a wonderful source for the inside scoop on the local television scene, full of news, gossip, history, and "Where are they now?" pieces. That information is still available, but it is all fading into history as time passes. This is a bit of a cheat. I never linked to this "new" blog for the radio personality known as John Webster. His old blog from his days at Rock 107 has been cybersquatted, but he kept this one updated until late last year, after which he decided to do all his updates on Facebook and Twitter. Tom Carten kept his meandering memoir blog going until a few months ago, when he finally decided to finish it with an "Amen." After a seven month hiatus, A Big Fat Slob finally decided to give up the ghost. In addition, there are forty-three blogs listed in the "Updates" section that have not been updated in over a year. I'm leaving all of these blogs where they are. All of them still have content. Some of them may come back. In other cases, it is possible that the bloggers in question have, in fact, died. I don't plan to punish them for this by delisting their blogs. The following blogs no longer contain any content, or point to dead links, or point to sites other than the original blogs - that is, they've been cybersquatted. It is with deep regret that I am removing them. I wish their former bloggers the best, and hope that maybe they'll decide to return to blogging someday. TheMorningMeeting.net - "the term we received could not be resolved"
Lorely's Musings: http://loreleysmusings.blogspot.com/ - "Has been removed." Starting A New Medical School: http://newmedicalschool.blogspot.com/ - "Has been removed." 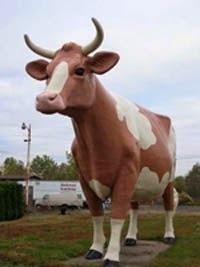 Republican in Northeastern Pennsylvania (NEPA): http://republicanfaith.blogspot.com/ - "Has been removed." We'll keep working to find more great blogs from Northeastern PA! Time for another sports blog! Ok, ok. You got me. Its another hockey blog. Tis the season, heyna? Highland Park Hockey is a blog that was just created last month which, much like "Chirps from Center Ice" and "Pens Universe", focuses on the Pittsburgh Penguins organization of hockey. The blog is authored by Tony Androck. This blog has been added to the sidebar under the sports section. I'm wondering if there are any local blogs that focus on the Philadelphia sports organizations? I haven't seen or heard of any. If you have any recommendations, please shoot them over to nepablogs@gmail.com. Baseball season is upon us once again and with the excellent weather that is happening today I can't think of a more fitting blog addition than The Yankees Blog. The blog is run by the Scranton Times-Tribune and is focused on the local WBS Yankees baseball farm team. Baseball isn’t limited to box scores and game stories, and neither is baseball news. Stay in the know with insight, breaking news and other Yankees nuggets from Times-Tribune beat writer Chad Jennings. He’ll check in regularly with transactions, game-day information and more than a few opinions. Who's ready for some playoff hockey? Raise your hands. Ok, the three of you in the back with your hands down can leave the room, as this most recent addition to NEPA Blogs is directly related to the local WBS Penguins. For those of you sticking around, keep on growing out those beards and #LETSDOTHIS. Introducing "Chirps from Center Ice" a fan blog about the AHL's Wilkes-Barre / Scranton Penguins authored by Jason Iacona of Pittston. Started a blog about a year later to go more in detail with the Twitter updates and add more. Never thought it would get as detailed as it is with AHL Previews at the beginning of the year for every team, Pregame “Gameday” reports, “Postgamer” writeups in addition to live tweeting the game in between. This blog is jam packed with tons of stuff from the WBS Pens universe - sidenote: DON'T DARE CALL THEM THE BABY PENS on Jason's watch. Also, of interest (but not technically qualifying as a "NEPA" blog per se) for Penguins hockey fans is the Pens Universe Hockey Blog. The Pens Universe hockey blog follows more of the goings on of the NHL (whereas Jason's blog covers mainly the AHL). Both links will be added under the sports section of the sidebar on the right. Looking for something to do this weekend (specifically Saturday)? 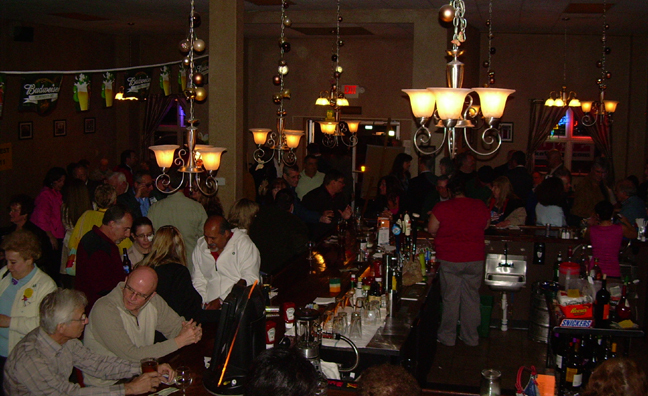 You should check out the FourSquare Day social meet-up which is taking place at Rodano's in Downtown Wilkes-Barre. The event, as I mentioned is on 04/16/11 and takes place starting at noon. More details can be found here. If you are on the fence about attending on Saturday, the following may sway your decision. The Downtown Wilkes-Barre Business Association his holding its 3rd annual Easter Egg hunt in the morning before the meet-up. You can literally bring your entire family out! Details are below regarding the Easter Egg hunt. The Downtown Wilkes-Barre Business Association invites families to attend the 3rd Annual Easter Egg Hunt, which will take place on Public Square on Saturday, April 16. The Easter Bunny will arrive atop a Wilkes-Barre City fire engine at 10:00 a.m., welcoming children 10 years old and under to find some of the over 5,000 colorful, goody-filled eggs that will cover Public Square. Hope to see you on FourSquare Day! Bill Greenlaw submitted Our Pike County to our NEPA Bloggers group wall. Our Pike County is a social network built on Ning.com. We are an online community for Pike County residents, businesses and organizations - a place to have fun, interact and organize. Through blogs, forum discussions,photos, videos, music, groups, and embeddable media, users get answers to their questions, find solutions to their needs, promote community events, share media, and organize and participate in interest groups. Users also participate in neighborhood groups where they communicate about neighborhood happenings such as community projects, crime, block parties, and yard sales. Surf on over and check it out! Did you know that NEPA Blogs has a page on Facebook Groups? It's true. Click here to go to the page, or search for "NEPA Bloggers" once you are logged into your Facebook account. A number of blogs have been posted to the wall of that page that were never added into our link sidebar. I'm taking some time this afternoon to add those blogs as well as let you know about a few other interesting sites that I've found through various social media outlets. #1 - http://childofemptiness.blogspot.com - Michael Scott of Wilkes-Barre (no relation to the manager of Dunder Mifflin in Scranton) states that he is actively trying to facilitate an interfaith and inter-spiritual conversation in the area. Be sure to check it out. #2 - is a good friend and loyal follower of my Twitter account. "Frank's Place" is the Blogger account of Frank Dutton who labels himself as a local history buff. 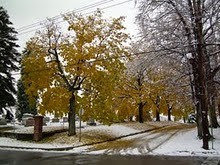 He posts amazing pictures of local scenery, historical sites and my personal favorite, trains/train stations! #3 and #4 - is one of the blogs that have been posted to the Nepa Bloggers Facebook account and hasn't been posted. I apologize for our negligence in this matter! Nicole Karr from the Benton area shares with us her personal and business blogs. Personal: http://whenareyoustartingablog.blogspot.com/, titled "Here and Now.... and Then - handmade projects, musings, and updates- from a half acre homestead in the middle of nowhere". It features very crafty things which make me jealous, as I do not possess a crafty bone in my body. The business blog is: http://springhouseshopandstudio.blogspot.com/ "Springhouse Shop and Studio". They're a husband and wife owned and operated custom woodshop designing and building furniture and cabinets from sustainably harvested local woods. #5 and #6 are the blogs of Ryan Balton. He shares with us a personal blog located at http://blog.ryanbalton.com and a blog dedicated to happenings in the Delaware Valley School District located at http://dv.ryanbalton.com. I also wanted to share the following non-blog site - The Agnes Anniversary Project. 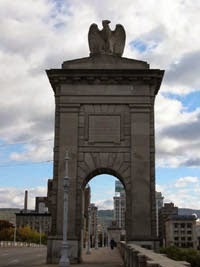 The site/project was spearheaded by Alan K. Stout of the Wilkes-Barre Times Leader. Alan and his project team of Richard Briggs, Dr. Anthony Mussari (NEPA Blogs, listed under the Windsor Park Stories), Tony Brooks of the Luzerne County Historical Society, and Frank J. Pasquini are spearheading a new documentary dedicated to remembering the 40th anniversary of the Agnes Disaster. You can also find them on Facebook under "Agnes Flood Anniversary Project". Several followers of their Facebook page have shared photos and other media that may be used in the documentary. Also, be sure to check out NEPAValley.com "NEPA's Social Network" which is aiming to be the new Facebook-esque LOCAL alternative to Facebook. Let me explain. It looks and acts exactly like Facebook, but is geared toward networking with the population of Northeast PA.
Before I close out this entry - don't forget to follow us on Twitter @nepablogs. Have a great weekend everyone! 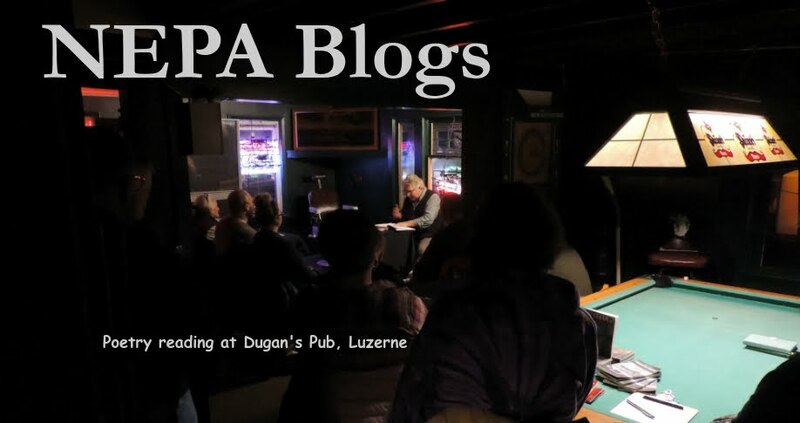 I'm happy to announce that there will be another Blog Fest coming up in a few weeks, at our usual hang out spot: Rooney's Irish Pub in Pittston. Click here to go the MenusNEPA page for the menu, hours and street address of Rooney's. I have attended the last two Blog Fest's (although I normally refer to them as "Blog Con") and it is a fun night out. Not only do you get to meet the local bloggers, but you get an opportunity to network with the local politicians as well. And hey -- even if that isn't your cup of tea, there's always beer to be had!